All times are preliminary until 2 months before departure. Please check to ensure the departure time. Mermaid Tour, Daily, duration 1.30 hrs. Christiania Tour, Daily - duration 55 min. Carlsberg Tour, Daily - duration 30 min. Mermaid Tour, duration 1.5 hrs. Christiania Tour, duration 55 min.  Carlsberg Tour, duration 45 min. 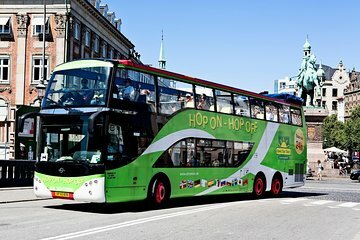 See the alluring array of cultural attractions Copenhagen has to offer on this hop-on hop-off sightseeing tour. Make your own way to one of more than 40 conveniently located stops and climb aboard either a distinctive double-decker bus or open-air boat to begin your adventure. Use your ticket on four distinct routes over a 48-hour period and swap routes easily with the closely located stops. 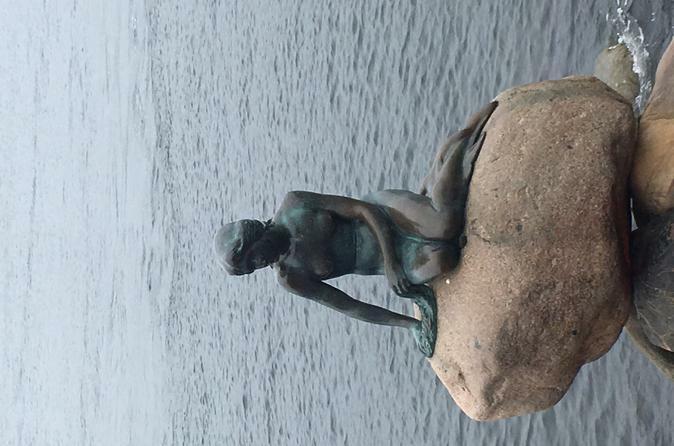 To see the impressive Black Diamond structure and the charming town of Christianshavn, climb aboard a bus on the Christiana Tour; and to capture photgraphs beside the iconic statue based on Hans Christian Anderson’s ‘The Litter Mermaid’, take the Mermaid Tour. Visit some of the capitals most renowned and remarkable attractions on the Carlsberg Tour or view the city from the perspective of Copenhagen’s picturesque canals on the Boat Tour. Please see the Itinerary section below for a full list of stops serviced by the buses. • Kalvebod Waves / Marriott HotelDuring the winter season (from September to May) the Boat Tour only stops at Gammel Strand/ Strøget and Nyhavn. Best way to see the city you are in and decide where you want to spend your time by hopping on and off. Busses run regularily and the narration was excellent. Highly recommend for every traveler. The boat ride was our absolute favorite, riding 2 diffeent boats on two different routes. Excellent value and super nice employees. We purchased at two day Hop On Hop Off Bus and Boat Tour. Both were enjoyable and informative. Our first day was on a Sunday and the frequency of buses was fine but the second day on Monday we spent considerable time waiting. They definitely were not every 30 minutes. It would have been faster to walk between locations on that day. Bus was pretty good. Wish the buses ran a little longer into the evening. Daniel was excellent as a tour guide on the canal boat. He knew his history and gave lots of information. It was absolutely wonderful! The routes were good, good value for the money. Problem we had was finding the bus stops. Some were well labeled, some were not. And you never knew what color bus you were looking for. First time to Copenhagen and we arrived on a cruise ship. This is the HoHo to take. We got around and had a great time. On time and got us back to the ship with time to spare. You can feel confident you are making the right choice. Great way to get an overall perspective of various neighborhoods and sights--especially if time is limited. The Boat tour was the best. Good to see the whole city in a short time. Gave us a good chance to see Copenhagen. This was a very convenient and inexpensive to obtain an introduction to the sights of Copenhagen. The boat ride was very informative as well. The boat tour was the best part for me. The 2nd day when I took the bus tour it was raining but I was at least able to see out the windows very well. Great way to get your bearings!